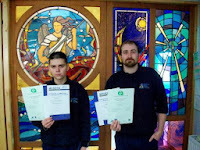 Ryan Irvine (left) & Lewis Wheatley (right) of Rainbow Glass Studio have both recently completed GQA Glass Processing Qualifications with RT Resources Ltd.
Rainbow Glass Studio from Prestwick, Scotland specialise in the restoration work of stained and leaded glass windows. This work includes historic and conservation work. Ryan completed his GQA Level 2 in Glass Processing in 2012 as a new recruit to the company and with Rainbow Glass’ commitment to training and development, he has now completed his Level 3 mentored by Lewis who also completed his GQA Level 3 in Glass Processing in 2013. Assessor Brian Moultrie said "Ryan progressed significantly from the early days of his Level 2 to the completion of his Level 3 qualification. Ryan is a big part of their team for the glass processing in the factory and also on site for the installation of the panels. Working with Ryan and Lewis was a pleasure and made it easy to assess them with their organisational skills".